Book and CD-ROM from C.H.I.P.S. 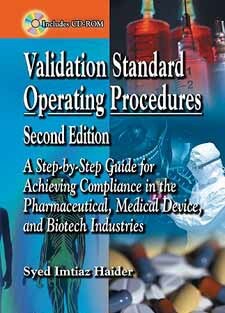 Spanning every critical element of validation for any pharmaceutical, diagnostic, medical device or equipment, and biotech product, Validation Standard Operating Procedures Second Edition guides readers through each step in the correct execution of validating processes required for non-aseptic and aseptic pharmaceutical production. With 14 exclusive environmental performance evaluations, Validation Standard Operating Procedures Second Edition features 64 new protocols on topics such as sterility assurance, media fill guidelines, and environmental control.